A Diamond the Size of Earth - is this Jupiter's core? In his book "2061 - Odyssey Three" (the third of his Space Odyssey series), Arthur C. Clarke put forward the intriguing proposal that the core of the planet Jupiter was, in fact, a diamond the size of Earth. Now Clarke, even though a science fiction author of some repute, had a science background and always tried to bring rigorous scientific accuracy to his stories. So, could his proposition be possible? The somewhat predictable answer is - we don't know. But we can analyse the possibility within known scientific parametres, to see if it is, at least, possible. For diamond to form, the element carbon must be present. Diamond, as you probably know, is a form of carbon, as is coal and graphite (the "lead" in pencils). It was once thought that the core of Jupiter was a giant snowball. However, the NASA probe Galileo, arriving at Jupiter in 1995 and orbiting the planet for the next eight years, sent back information that changed all that. It found that Jupiter contained far less water than originally thought, but was very abundant in hydrocarbons - things like tar. The possible composition of Jupiter's core was therefore changed to incorporate this new information. What was important here was that carbon was indeed present - but in chemical compounds. It is now also known that the interior of Jupiter contains liquid hydrogen, which can only exist under tremendous pressures. Whether this pressure also results in the carbon separating from the hydrogen atoms is a matter of conjecture. Anyway, supposing that free carbon molecules exist at Jupiter's core, what are the criteria for them to become the form known as diamond? Well, high pressure is one - and Jupiter's interior certainly has that. Also, the environment must be at a certain temperature - something above 1,500 degrees Celsius, again present within Jupiter. So, in theory, a core that is a diamond the size of Earth could be possible. Let's hope so anyway. 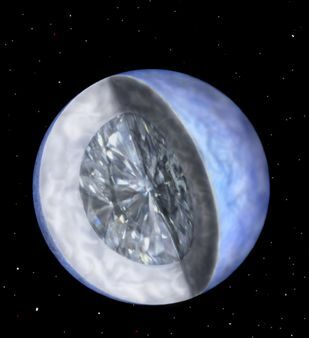 Until the Jupiter diamond core issue is proved one way or another, the biggest actual diamond ever discovered in our galaxy is a star formerly known as BPM 37093, in the constellation Centaurus, which is about 50 light years from Earth. This heavenly body is actually a white dwarf star, around 2,500 miles across, making it slightly larger than our Moon. It is made up of crystalized carbon, cloaked in a layer of hydrogen and helium gas. Although not quite a diamond the size of Earth, it has still been calculated at 10,000 million million million million million carats! It has been postulated that the two outer liquid giants of our solar system, Uranus and Neptune, are hiding, beneath their dense atmosphere, oceans of liquid diamond, in which float solid diamond icebergs! It may seem far-fetched, but this proposal comes from a respected American scientific institution, Caltech. These two planets are rich in methane, which is a compound of hydrogen and carbon. Under certain conditions of pressure and temperature, these can be forced to separate, resulting, usually, in hydrogen and graphite. Special circumstances may cause the carbon to crystallize as diamond and the pressure involved is sufficient to keep it in liquid form. Imagine that - an ocean of liquid diamond! You can't, can you?